Nor did I. I have some material on IR87 but am still lacking information on RIR87. Thus, I cannot confirm whether the legends on these cards are accurate. On other French propaganda postcards we see colors which they claim were conquered from bavarian troops but clearly show a prussian flag. Chris, I would love to see some of your RIR87 stuff and learn more about the regiment. These are two World War I French propaganda postcards, celebrating the conquest of the flag of the (1st Battalion) of the 1st Nassovian Reserve Infantry Regiment. 87, which, however, contradict each other in the details. One of the legends also states that the flag had been left on the field in a panic escape. The troop flag had its firm place as a recognition symbol; because of their significant role as the centre of battle for the soldiers of their unit, the flags gained a special nimbus. Their loss in combat was considered a great shame. Often a prize or an award was granted for conquering enemy flags. In the First World War, the flags were taken to the field in the beginning, but then brought home later with the beginning of the trench war. Thus, such events are likely to have occurred especially at the beginning of the War. Just for illustration purposes, you can also see the medal bar of a member of this regiment. This is a most surprising statement given the heavy losses the Nassauers suffered at Waterloo. Could you be so kind as to elaborate a bit on it? Wenn Du mal irgendwo irgendwann einen EH vom Hersteller Wagner siehst - ich will ihn haben. Schick mir dann unbedingt eine PN. It was awarded to the two Nassau Regiments and the (Dutch) regiment Nassau-Oranien. Your 3k figure is much too low. This is hardly surprising given his low rank. Please keep me informed in case he should turn up anyway. Thanks in advance! This the medal bar of the spark Arno Weichler, who was active on SM U 35, the most successful submarine of all time under the command of Arnauld de la Periere. 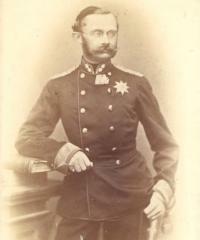 More Information: https://en.wikipedia.org/wiki/SM_U-35_(Germany) https://en.wikipedia.org/wiki/Lothar_von_Arnauld_de_la_Peri%C3%A8re The latter mentions him in his memoir when he reports an unpleasant encounter with the ship's mascot, the monkey Fips. The "Iron Crescent" could be have been awarded in reaction to the following episode: "At the end of October 1915, U 35 took over ten Turkish officers at Bodrum and war material to support the insurgent Senussi who fought in the Libyan desert against the British and Italian colonial powers. As far as the weather permitted, two Turkish schooners were taken in tow. The convoy arrived at the Libyan coastal town of Bardia, where the cargo could be unloaded. On November 5, 1915 the British steamer Tara was sunk in the Gulf of Sollum (Egypt) and a gunboat in the port of Sollum was destroyed. " The bar was already presented twice in OMM (1993 and 2000). The reason why I show it here again is that I have discovered Weichler together with de la Periere in a film document (starting at 21:55): https://www.youtube.com/watch?v=ZxsjPku8zR4 How often do you find a film document of a lower rank medal bar owner? This set belonged to First Lieutenant Friedrich who served in the Marine-Infanterie-Regiment 1 which fought in Flanders. 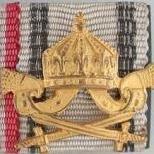 Does anyone have the regimental history (Das Marine-Infanterie-Regiment 1 1914 – 1918, nach amtlichen Kriegstagebüchern und nach den Aufzeichnungen von Mitkämpfern, bearbeitet von Angehörigen der Vereinigung der Offiziere des ehemaligen M.I.R. 1 und des 1. Seebataillons. 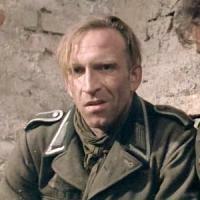 Herausgeber: Theodor Kinder, Ltnt. d.R. a.D., Kiel 1933) and/or can add details with respect to Friedrich? Thanks in advance! The last award (Kriegerverein 1866er?) still to be identified. ...another one with 1863/64, 1866 and 1870/71 awards. The "EL" cypher was used in Hessia for Ernst Ludwig but in that case it should probably have a crown. Russia? Long Service bagde? Firefighters? Can someone identify this piece, please? Thanks in advance!